Set 1 each Super Fine Grit (1200) Fine Grit (600) Medium Grit (400) Coarse Grit (250) & Extra Coarse Grit (150) diamond pads. Very effective in hard to get places carbide table saw blades router bits deburring. many uses include hunting and fishing knives axes woodworking tools and carbides. 3/4? x 2? Diamond Pat on a 6? x 3/4? Plastic Handle. 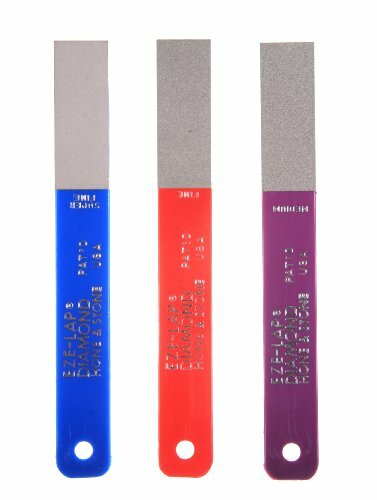 Contains super fine, fine and medium grit diamond stones mounted on color coded plastic holders. Each sharpener is 5 7/8" overall with 2" x 3/4" sharpening surface. Packaged in handy storage pouch. Set 1 each Super Fine Grit (1200) Fine Grit (600) Medium Grit (400) & Coarse Grit (250) diamond pads. Very effective in hard to get places carbide table saw blades router bits deburring. many uses include hunting and fishing knives axes woodworking tools and carbides. 3/4? x 2? Diamond Pat on a 6? x 3/4? Plastic Handle. Oval and flat surfaces with fish hook groove. Light and compact. You can take it anywhere. 2 1/4" rod. 5 3/4" overall. EZE-LAP Diamond Products has been the pioneer and originator of diamond sharpening tools, starting in the early seventies. 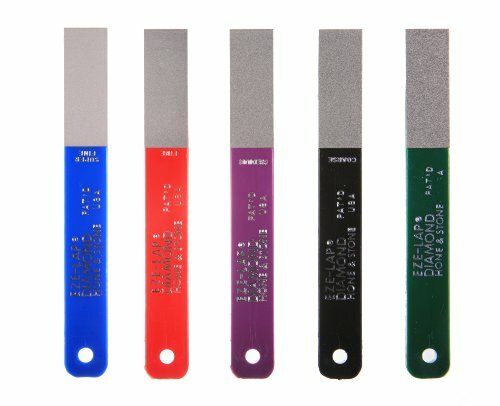 Our patented bonding process and modern technology allows us to produce the finest quality sharpening products at an affordable price. This process has often been imitated but never duplicated. EZE-LAP's unique blend of industrial diamonds combined with our patented bonding process gives you the hardest, most durable, longest lasting surface available. Because of this you are able to easily sharpen carbide, tool steel, titanium, ceramics and most any super hard material including the newer materials being used by most knife manufacturers. 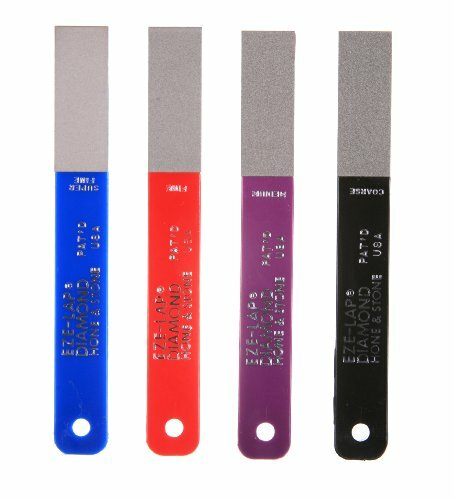 EZE-LAP manufactures the widest variety of diamond sharpening tools available. This allows you to pick and choose the sharpener that will best serve your needs. No other manufacturer offers the choices we do. We have items for use in the kitchen, shop or field, servicing the outdoor, DIY, machine tool, wood working/wood carving, culinary/food service and other markets. All of our items are proudly Made in the USA. Double sided. 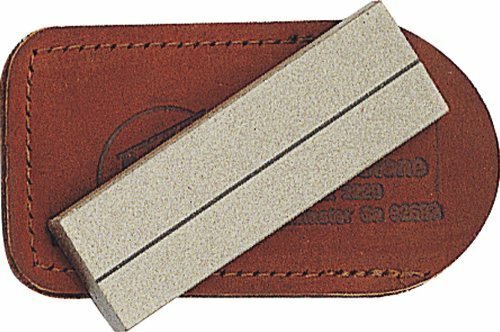 4" x 3/4" sharpening stone. One side is super fine diamond and one side is ceramic. Flip stone out for sharpening. Stores inside white plastic handle. Hang packaged. (Both sides of sharpener shown). Measures 1" x 6" with fish hook sharpening slot. Fine grit. Comes with leather storage pouch. Want more Eze Lap Sharpeners similar ideas? Try to explore these searches: Style Spare Ribs, Floral Maxi Dress, and Classic Cherry Wood.